Vegan options are so readily available these days that I am taken by surprise if we are somewhere that doesn't have vegan choices. Generally this only happens in independent cafes or restaurants in relatively small towns. If you are somewhere big, or have access to chain restaurants, there are likely to be multiple vegan choices. Below are some of my recent discoveries and highlights. 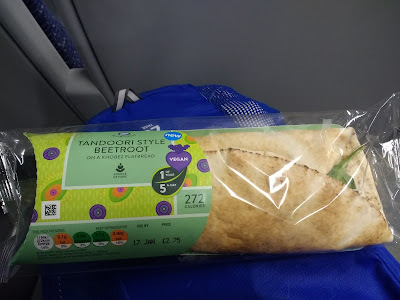 An unexpected winner in my recent tastings is the tandoori style beetroot flatbread from Boots. 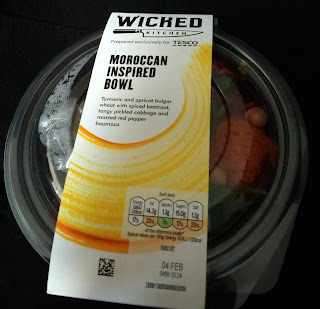 This is one of several new vegan additions to the Boots meal deal range, and I have yet to try the other new flavours because I like this one so much. It features roast beetroot, spicy tikka hummus, a tomato, chickpea, onion and coriander 'kachumber mix' plus vegan mint and cucumber mayonnaise and spinach. I love the fresh flavours and the option of a lighter wrap, with this having half the energy, fat and salt of many options. Perfect for allowing room for snacks/dessert! More substantial, buy ahead options are available in the new Tesco Wicked Kitchen range. This received quite a lot of publicity when released, with some criticism over too high prices and insufficient flavour. 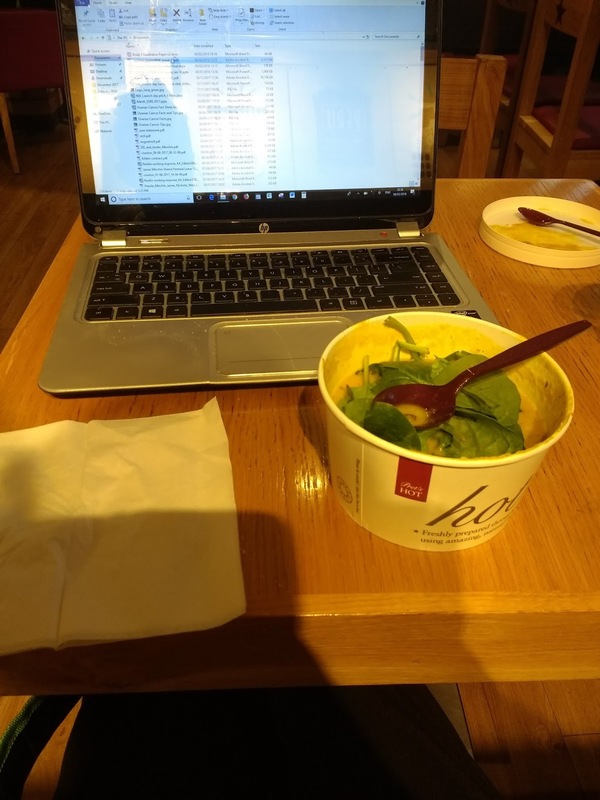 Personally, I think the prices are reasonable (around £4 for most items) if compared to buying lunch at Pret a Manger or a cafe. Compared to making your own, or standard supermarket fare, these are of course more expensive choices. 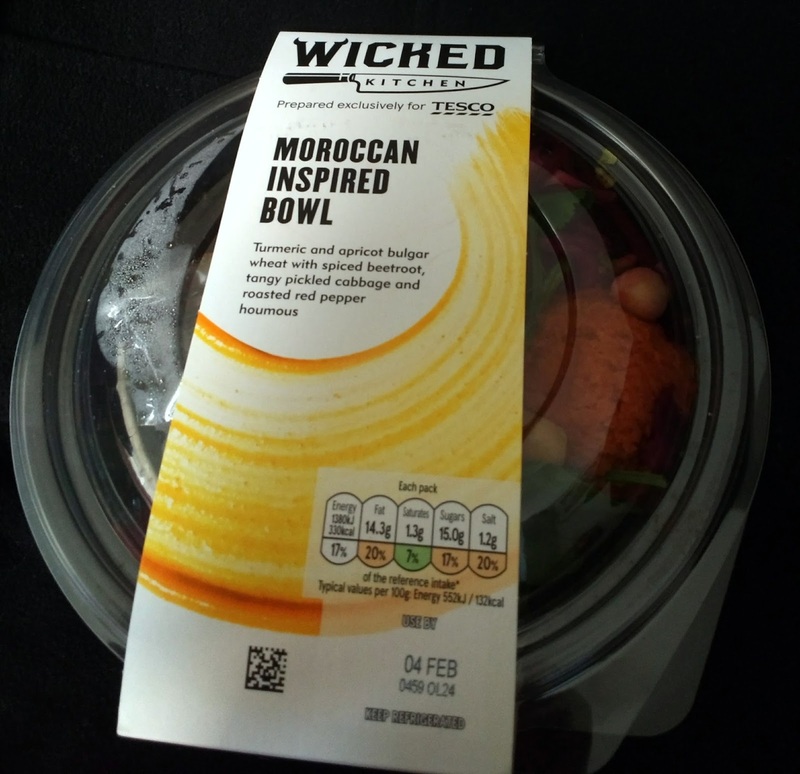 I've tried two of the Wicked items: teriyaki noodles, pictured above, and the Moroccan inspired salad bowl, pictured below. Both were good but not terribly exciting. They are also not dissimilar to dishes I make at home, which is my main criticism of the Wicked range - the options are generally within my repertoire of home cooked meals. Also similar to what I can make at home, but cheaper and helpful if short on time, are the Bol meals and soups available in most supermarkets. 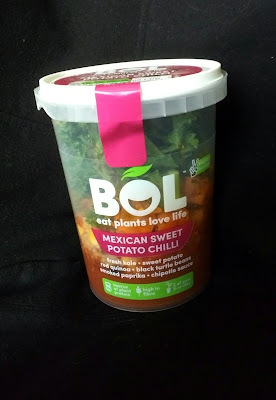 Bol recently announced that they are going 100% plant based and I like that their containers are also recyclable and reusable. I've tried a few of their offerings, with the Mexican sweet potato chilli below being an enjoyable example. 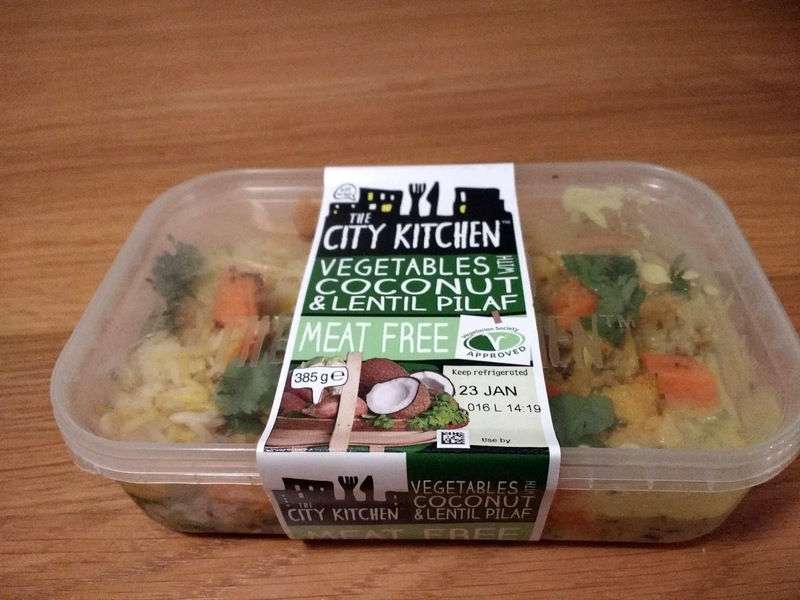 Another supermarket buy is the vegetables, coconut and lentil pilaf made by The City Kitchen. I really enjoyed this and found it offered a perfect balance of curry mix to rice base. 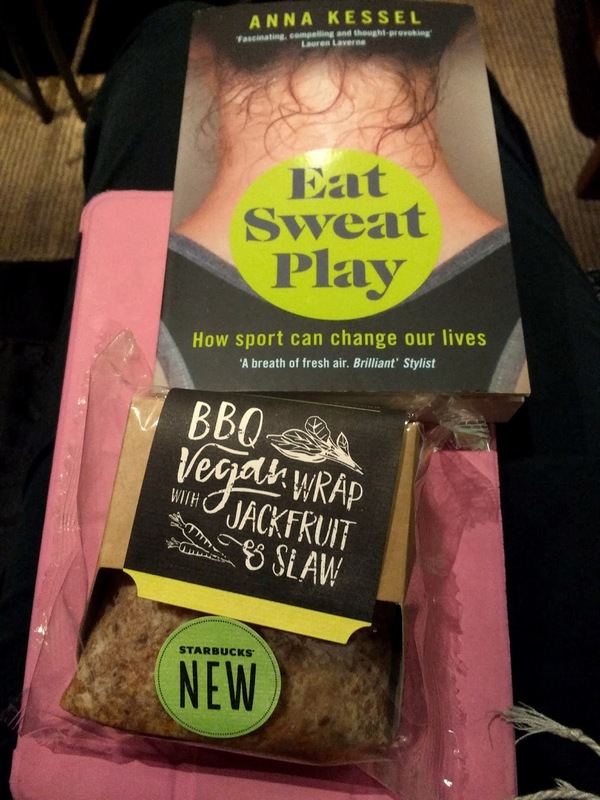 Moving back away from supermarket options, Starbucks now have a vegan BBQ wrap with jackfruit and slaw. It was my first time trying jackfruit, so interpreting the wrap is complicated by discovering that ingredient. 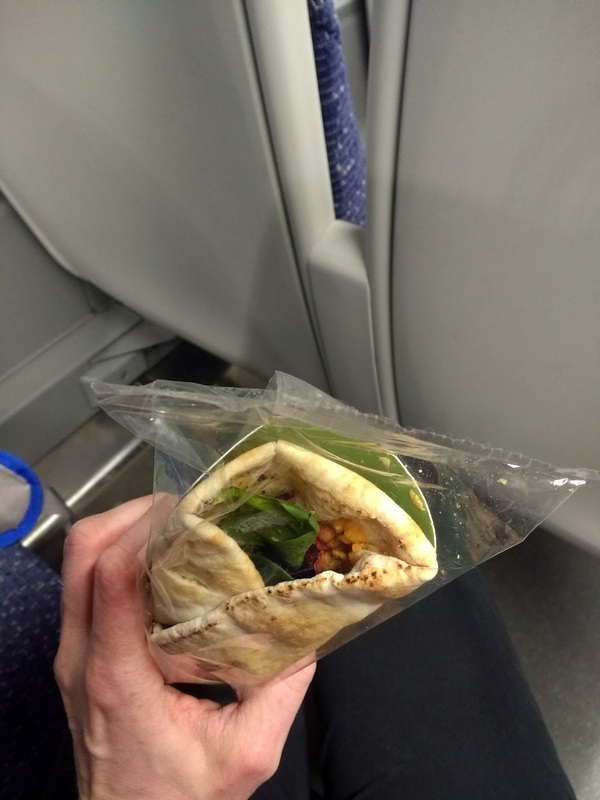 I quite liked the wrap, but it tasted healthy in a stereotypical way - by which I mean that the filling was a bit bland and the wholemeal wrap a bit too chewy and dense. I confess I expected nothing else from Starbucks. Pret a Manger also have new vegan items in their lunch range, but I have neglected to photograph the curried chickpea sandwich (which is delicious) and rainbow veg flat bread (also good). I did photograph, but very poorly!, the cauli and sweet potato dhal hot pot. This was tasty and satisfying, but again similar to what I make at home. Last but not least - dessert options. I spotted a new-to-me range of vegan cookies by Kookie Cat in Planet Organic. 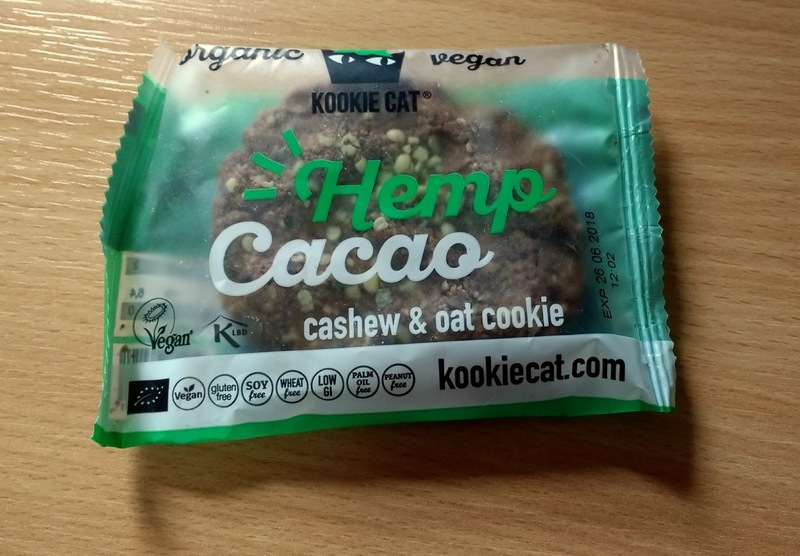 This hemp and cacao flavoured cashew and oat option was delicious. Costa Coffee also have two new vegan slices in their repertoire, as well as adding coconut milk as a milk option for their drinks. 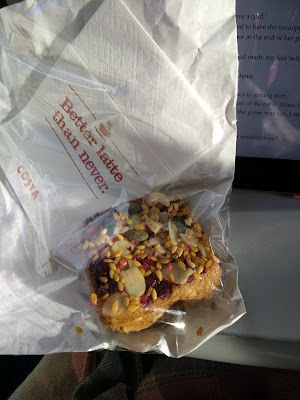 I loved the oaty jam bake (below) but wasn't a big fan of the 'Paradise' slice featuring coconut and chocolate. I found that a big dry. What new (or not so new) food items have you enjoyed lately? I am definitely past the days of feeling pathetically grateful - which is a mixed blessing really as it was nice to be easily satisfied, but it's nicer to have choice! Thanks for a fun post - I enjoy seeing what you can buy overseas ( you wouldn't even get this much in vegan here). 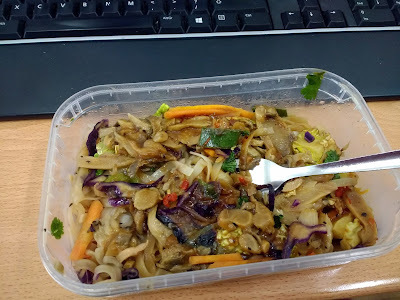 I definitely feel like readymade vegan options have turned a corner recently - it's so nice to know that when you get stuck there are choices out there (especially if some of them are so tasty!) My fallback when I'm out of homemade food is Leon's wrap - though maybe that's just because I like the fact they have vegan doughnuts in some of their branches too! There certainly has been a proliferation of vegan options at mainstream eateries in the last five years or so. I am not vegan, but I get excited by the vegan options now too. Like Johanna I wonder if I can make the tandoori beetroot version at home. Thanks for sharing your thoughts on the ones you tried, I am personally quite impressed by M&S range, though I must admit - I don't eat lunch out that often. I am yet to try the newest M&S vegan sandwich but have also been impressed at their expanding range. That beetroot flatbread sounds so unique! I've never seen anything like it. I'm not a fan of beetroot myself, but am pretty intrigued by it. I like the look of Bol, it looks like a good option if pressed for time (or lacking energy ;). That coconut, lentil pilaf looks SO GOOD! I never see things like that around where I live. Yum. Our Starbucks do not have vegan wraps!!!!! That looks so fun. 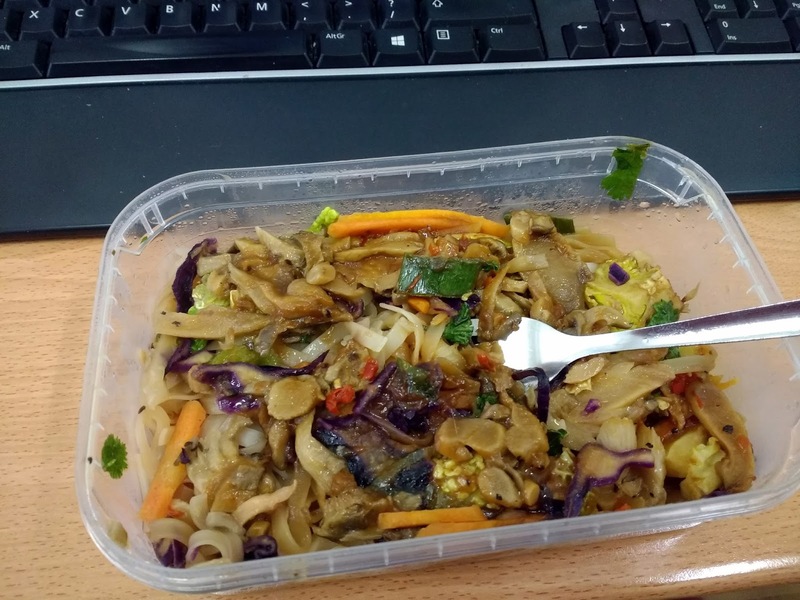 We got a new vegan salad... but it looks pretty boring so I haven't even bothered trying it yet.